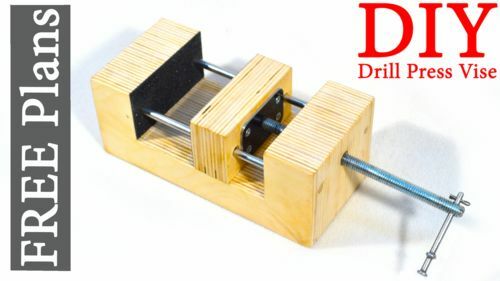 Here is a Drill Press Vise I built. I included a PDF plan in the videos’s description. Nice video and a great little helper! Love your projects and just noticed you got Maker in you last name how cool is that. That’s a very nice shop and it’s nice to have a plan. You did a fine job on it. That s a very nice shop and it s nice to have a plan. You did a fine job on it. Nice design, and great video of how to build it. I always enjoy your videos because they cut right to the important details, and show just the right amount. Gonna make one for sure! 1. I don’t think that connecting metal plate and vise screw is necessary. Am I wrong? 2 Is it hole (for handle) in the vise screw make it week point? Yes, you can leave it as is, I just wanted the vise screw to drag the jaw open. Yes, it would make it weaker at that point. I was OK with it as I made this vise only for light duties. 1. I don t think that connecting metal plate and vise screw is necessary. Am I wrong?